Established on July 18, 1992, Greenland Group is one of the biggest state-owned enterprise in Shanghai as well as a leading comprehensive real estate enterprise in China. Greenland Group has formed a diversified industrial structure through both industrial and capital operation which is “energy and finance sections develop simultaneously with real estate as main occupation”. Greenland Group ranks No.359 in 2013 Fortune Global 500 list, 55th place among Top 500 China enterprises and 1st place among comprehensive enterprises centering on real estate. Greenland Group takes real estate development and operation as core and leading industry. The construction projects cover nearly 65 cities in 24 provinces of China. Greenland Group enjoys a leading place in terms of developing scale & type as well as quality & brand, especially in extra-high buildings, large urban complex, high-speed rail station commercial centre. 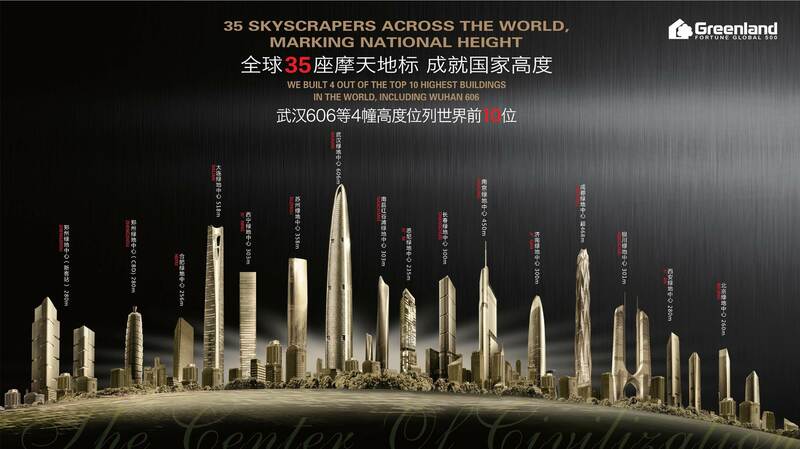 17 extra-high landmark buildings developed by Greenland Group are now completed construction or under construction. 3 are listed among Top 10 extra-high buildings all over the world. © 2019 IWCITY. All Rights Reserved.